The fortress of Migdal Afek controlled the narrow pass of Via Maris. Wars 2 19 1: "...a great body of Jewish forces gotten together in a certain tower called Aphek"
The fortress of Migdal Afek controlled the narrow pass of Via Maris ("Way of the Sea"), located near its location. Remains of settlements spanning from the Roman to the Ottoman periods are located in the National Park. The National Park of Migdal Afek, also known as Migdal-Tsedek, is located south of the modern city of Rosh Ha-Ayin. The fortress is built on top of the south hill, at 130m above sea level. Enter the park from road #444. The route of this modern road follows the ancient trade route known as "Via Maris" - way of the Sea - that once connected the south (Egypt) to the north (Syria). From the parking lot you can climb up the south path to the fortress, or the north path to the Sheikh tomb of al-Sadiq. Point on the yellow points to navigate to the selected point. The archaeological survey identified ceramic remains starting from the Iron II and Persian periods. During these times the area witnessed a great increase of settlement, when the Israelites moved from the hill-country of Ephraim to the western lowland. A Roman settlement was located on the hill, called at those times Migdal Afek ("Tower of Afek"). It was one of the satellite towns of Antipatris (Afek), a central city located 3.5 km northwest. "And now Gallus, seeing nothing more that looked towards an innovation in Galilee, returned with his army to Cesarea: but Cestius removed with his whole army, and marched to Antipatris; and when he was informed that there was a great body of Jewish forces gotten together in a certain tower called Aphek, he sent a party before to fight them; but this party dispersed the Jews by affrighting them before it came to a battle: so they came, and finding their camp deserted, they burnt it, as well as the villages that lay about it". At the end of this short campaign, the Romans were defeated, giving time to the Jewish rebels to prepare themselves for the next onslaught of the Roman armies. The great revolt ended after 4 years (70AD) with the destruction of Jerusalem and many Jewish cities and towns, probably including the village of Migdal Afek. "...at the beginning of the spring he took the greatest part of his army, and led it from Cesarea to Antipatris, where he spent two days in settling the affairs of that city, and then, on the third day, he marched on, laying waste and burning all the neighboring villages". The Roman settlement was renewed and continued through the Byzantine period. Remains of this period are visible in the fortress, as the stones were reused in later periods. A 5th-6th Century Greek inscription is seen in the lintel of one of the rooms inside the fortress, taken from the ruins of a Church. The inscription on the lintel reads "The Memorial Church of Saint Cerycus". St Ceriacus, according to Legend, was a Roman nobleman who converted to Christianity as an adult, gave away is fortunes to the poor, and attended poor and sick people. He was tortured and killed during the persecutions of Diocletian (303 AD) and became a martyr and saint. A monastery dedicated to Ceriacus was located in Migdal Afek. "The Memorial Church of Saint Cerycus"
The Crusaders arrived from Europe to the Holy Land in order to liberate the Holy Land and free Jerusalem. They accomplished the mission in 1099, and established the Crusader Kingdom. During the Crusaders period, in the beginning of the 12th Century, the Ibelin family constructed here a fortress. The fortified complex was named by them "Mirabel", a Latin word meaning 'wonderful'. 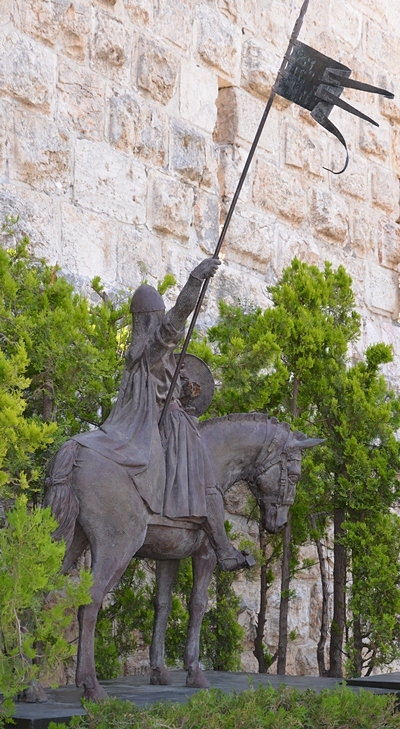 In 1141 the Crusader King Fulk the Younger constructed a massive castle on the summit of Tel Yavne, south of Migdal Afek, and named it Ibelin (which is based on the Hebrew name Yabne). Fulk of Anjou, King of Jerusalem (1131-1143), gave this castle at that year as a gift to Barisan, the founder of the Ibelin family. This was a reward for Barisan's loyal service during the 1134 revolt of Hugh II, count of Jaffa, against King Fulk. Barisan, who rose from a humble origin from Italy, died in 1152. The Ibelin family, named after the fortress of Ibelin, became one of the noble Crusaders families. The castle in Migdal Afek was constructed by the Ibelin family. They continued to posses lands in the Holy Land until the 13th Century and in Cyprus until the 15th Century. The Ayyubid dynasty was founded by Saladin (Salah ad-Dīn Yusuf ibn Ayyub), and ruled Syria and Egypt (1171-1341). It defeated the Crusaders in the decisive battle of Hittim (July 4, 1187). Following this victory, the Mirabel fortress was captured by Saladin's brother al-Adel I in 1187, and made the fortress a Muslim Ayyubid base against the Crusaders. However, Saladin ordered to demolish the fortress in 1191 to prevent the Crusaders of the Third Crusade (1189-1192) to hold this strategic place. Mirabel was in ruins until 1266 when the Mamelukes rebuilt it in order to protect the road from Jaffa. However, the fortress was abandoned at the end of the 13th Century. Starting from the 16th Century, an Arab village of Majdal Yaba ("Tower of Jaffa") was located on the hill. Conder and Kitchener of the Palestine Exploration Fund (PEF) surveyed the area during the Survey of Western Palestine (SWP) in 1874-75. The map on the right is a section of their survey results. Over the lintel is a semicircular arch with a keystone. The inscription is on a winged tablet ; the door is to the right on entering the house, and the arch faces eastward ; the letters are about 4 inches long. The doorway leads into a vault with a barrel roof, and the arch over it inside is slightly pointed. The lintel is probably not in situ, but must have belonged to a church, probably of Byzantine period. A little further north are fragments of a building, which appear to be Crusading. At Sheikh Baraz ed Din there are several rough tombs and caves, one cemented. There is also a tomb of the kind called 'rock-sunk,' with a vault about 6 feet deep, and two unusually broad side loculi ; thus, once more, the 'rock-sunk tomb' appears in connection with Christian ruins. - Visited 28th May, 1873". Their report also described the importance of the fortress at this point (p261): "
"We may now turn to the military aspect of the question, and ask what would be the best line of defence for an army to take up on the plain to prevent the march of a force southward. To this there can be but one answer—the line of the Nahr Aujeh [BW: the Meandering river - Nahal Yarkon]. From the fountains at Ras el 'Ain [ BW: Rosh Ha'Ayin] to the sea the river is deep, unfordable for several months in the year, and has in several places marshy banks. It must thus have always presented a serious obstacle to the advance of an army, and one which no soldier acting on the defensive would neglect to make use of Between Ras el 'Ain and the foot of the mountains there is but a comparatively narrow strip of level ground, forming a pass, through which any force advancing southwards must march, and one that could be easily closed by towers and a ditch. That the Crusaders were not ignorant of the military value of this feature is apparent from the ruins of the castles of Mirabel and Mejdel Yaba, guarding each flank of the pass ; and if Antipatris were at Ras el 'Ain, Herod, in selecting the site, was no doubt influenced by military considerations"
During the 19th Century the al-Rayyan Bedouin family (called Beit el Jemainy) controlled the village. The Rayyan family, who originated from the south Shechem hill country, was headed by Sheikh Muhhamad Al-Sadiq al-Jamma'ini. His tomb is located on a hill north of the fortress. Al-Sadiq rebuilt the ruined fortress in ca. 1850 , and used its strategic location to collected taxes. The village was renamed to Majdal al-Sadiq ("Tower of Al-Sadiq al-Rayyan"), which is the base of the Hebrew: "Migdal Tsedek". The majority of the fortress buildings are dated to his times. Al-Sadiq was then punished by the Ottomans and exiled to the Black Sea area. The village became a ruling center for more than 20 villages controlled by the Rayyans, but after being defeated by the Qassims in 1860 they lost their control outside Majdal al_Sadiq. During the British Mandate (1922-1948), the stone quarries of Migdal Zedek supported most of the building boom of Tel-Aviv. The stone factory, which was founded in 1924, was attacked and damaged during the 1936 Arab riots. The Arab village of Majdal Tsedek was ruined and deserted in 1948 during the Israeli Independence war. The village was a base for the Iraqi forces who launched attacks against the Jewish population in the area. The area became a National Park in 2008, and is open to the public. The fortress is located on the southern hill. Most of the structures are dated to the 19th Century house of Sheikh Muhhamad Al-Sadiq, with some remains of the Crusader-period fortress ("Mirable"). An aerial view from the north side of the fortress was captured by a quad copter. A closer view on the north east side of the fortress is seen in this next photo. The entrance to the fortress is located on the north side. The gate to the fortress is seen in this closer view. On the left is a trench with exposed foundations, where Roman stones can be seen. On the west side of the gate are a number of structures, most of them in a bad state. Past the entrance leads to an open courtyard, with the halls surrounding it. An Aerial view of the plan of the castle is seen here, as captured from the north east side. You can also "fly" over the castle with this Youtube video. The following photo shows the west side of the courtyard. The entrance is seen on the right side. The facing eastern side of the courtyard is shown in the next photo. Above a side door near the entrance to the courtyard is a lintel, which was reused from a Byzantine monastery and is dated to the 5th-6th Century AD. The lintel bears the Greek inscription : MAPTYPION TOY AΓIOY KIIPYKOY, meaning: 'The Memorial (Church) of Saint Cerycus.' A monastery dedicated to St. Ceriacus was located in Migdal Afek during the Byzantine period. Most of the remains are dated to the Ottoman period (19th Century), and some of them are from the Crusaders period (12th Century). This hall leads from the courtyard to the eastern wing of the fortress. On the hill north of the fortress are a number of tombs, rock cut graves and other remains. A Sheikh tomb is located on top of the hill, with a carob tree on its side. This is the tomb of Sheikh Muhhamad Al-Sadiq al-Jamma'ini, who ruled the village and rebuilt the fortress. The name of the Arab village, Majdal al-Sadiq ("Tower of Al-Sadiq"), is named after him. 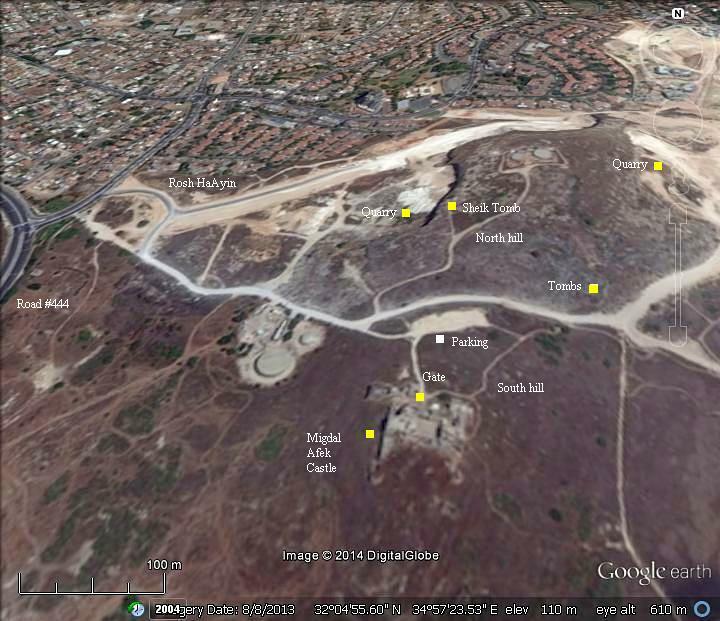 It is the base of the Hebrew name of the fortress: "Migdal Tsedek". The tomb is 5.8m by 6.35m, and was built over an ancient structure. The entrance, 1m wide, faces north. Another grand tomb, dated to the Ottoman period, is located at the foothill. This was part of the Muslim cemetery. Migdal Afek was a Roman village, and remains of this period are found in rock hewn tombs. A burial cave, dated to the Second Temple era, is located on the east side of the north hill. A closer view of this rock hewn burial cave is seen below. A number of steps descend from the entrance inside the 3m x 3m cave. Inside there are three pairs of burial chambers, a pair facing the entrance and two pairs on either side. Each burial chamber measures 0.7m wide and 2m high. Another burial cave dated to the Second Temple era is located nearby. It consists of 16m wide vertical cutting with an entrance to the burial complex in its center. A drafted lintel surmounts the entrance. This complex may have been part of a mausoleum. Other burial caves are scattered around the north and south hills, as well as cisterns and agriculture installations such as wine press treading floors and oil presses. This water cistern, 4.3m by 5.3m, is 4m deep. Around it is are stones arranged in a semicircle (9m diameter wide). To the north and east of Migdal Afek is a wide area of quarries. During the British Mandate (1922-1948), the stone quarries of Migdal Zedek supported most of the building boom of Tel-Aviv. In the far background are the houses of the Jewish city of Elad ("Forever God"), a religious municipality established in 1990. There are also several lime kilns, which were part of the stone factory complex. The kiln was used to burn the quarried limestone. The process produced quicklime through the calcination of limestone. The process required a temperature of 900 degrees which was reached in these ovens. The product, quicklime, is a key ingredient for the process of making cement, and is used for other industrial purposes. Mejdel Yaba, Majdal Yaba - Ottoman period name, Arabic: "Tower of Jaffa"
Archaeological Survey of Israel - Map 78, sites 132-136.